Adore the glamor of yesteryear? Go retro with romantic and floral vintage wedding cakes. This is a great idea if you are rocking the pearls or lace on your dress on your wedding day. A twist on the classic wedding cake, just two tiers! 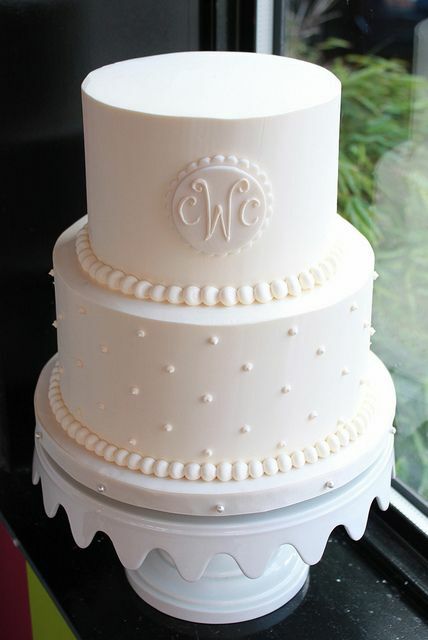 Monogrammed vintage wedding cakes by Whipped Bakeshop. 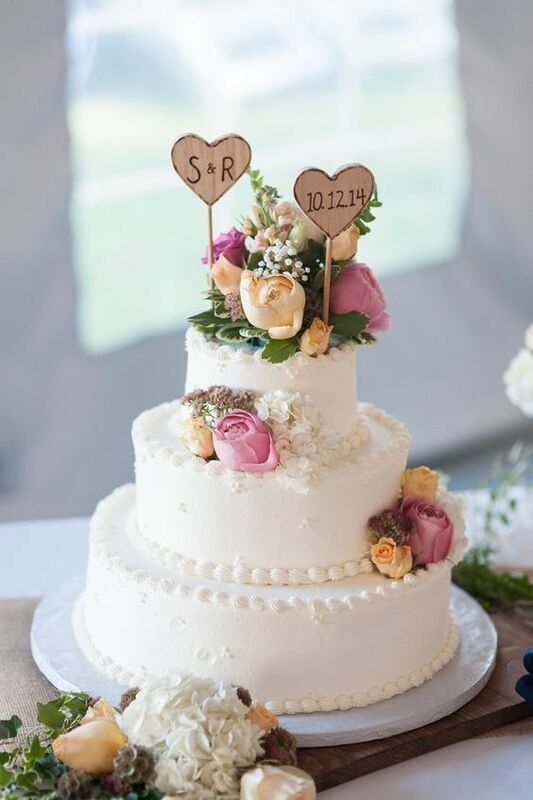 Vintage wedding cakes can easily turn into the center of attention at a reception. Hand-painted, romantic, adorned with lace, or with brocade details that evoke old memories from our grand-parent’s times. 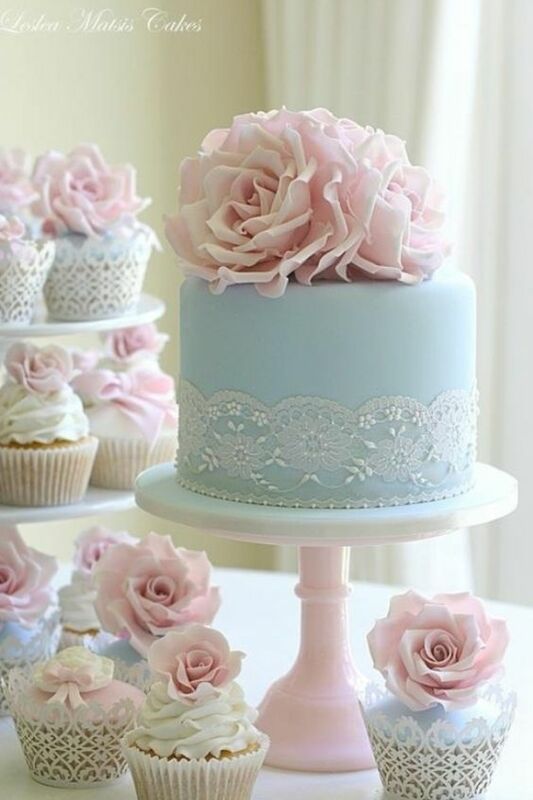 Let’s delve into the world of vintage cakes loaded with fondant, buttercream, pearls, sugar roses and antique decor. What Makes a Wedding Cake Vintage Inspired? There are thousand of different ways to achieve the timeless vintage look for your cake. 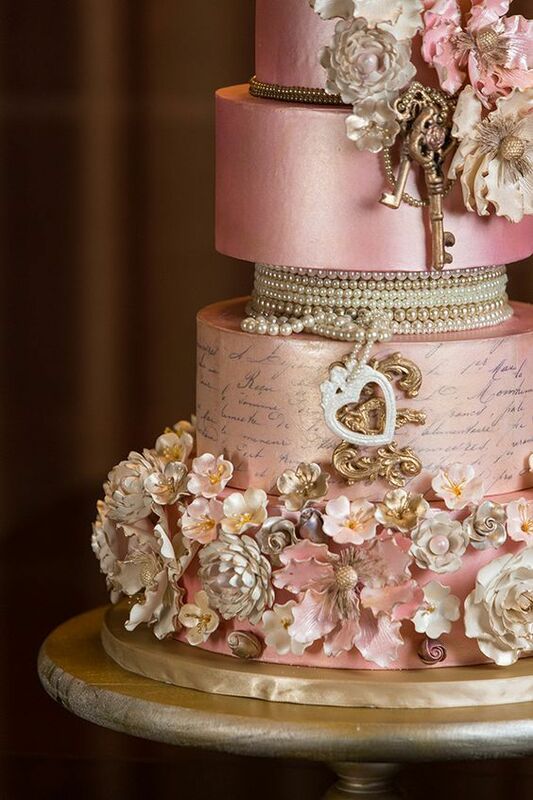 The classic elegance of pearls is often found in the details of the vintage cake. 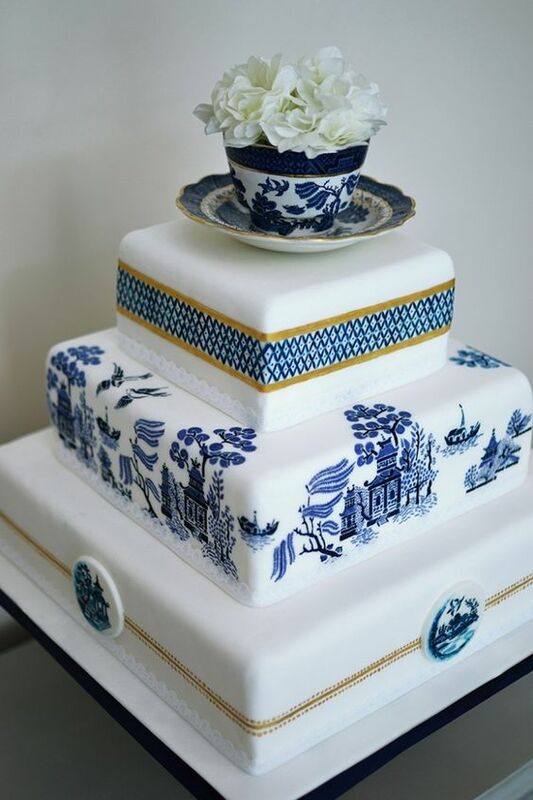 Actual lace can be placed on the cakes or even piped lace. You can mimic your wedding dress’ lace design, add a cascade of fresh flowers or sugar flowers in pink, lilac, green or beige. If you are using bird cages on your decor, crown your vintage wedding cake with a cage filled with baby’s breath. The soft pastel vintage colors, the opulent juxtapositions of lace and pearls, hand-painted masterpieces will add a layer of sophisticated elegance and beauty to your wedding cake. Go fancy with playful black and white polka dots or give a nod to the lace. Incorporating jewelry – like brooches or beads and even more fashionable than lace – is what really adds that touch that sets it apart from other vintage designs. If jewelry on the vintage wedding cake is not really your thing, subtle and glossy edible pearls may be just what suits your style. 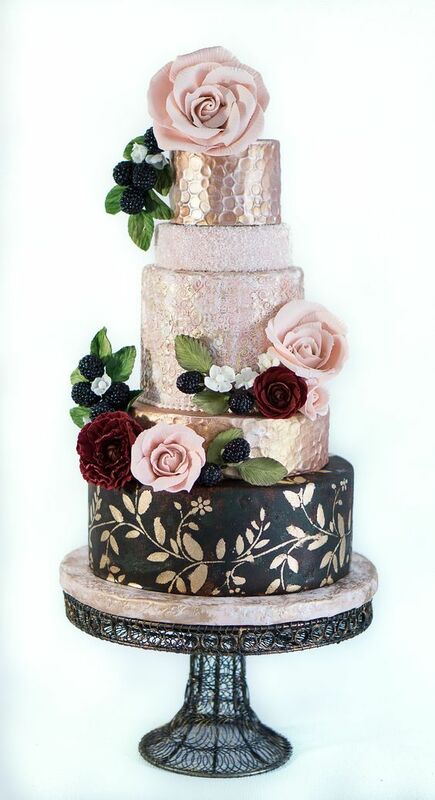 A gold leaf finish over the wedding cake adds a refined elegance and takes it all the way to the Gatsby era. Wanting to put your own stamp on a traditional style? A modern twist on a vintage cake may be just for you. 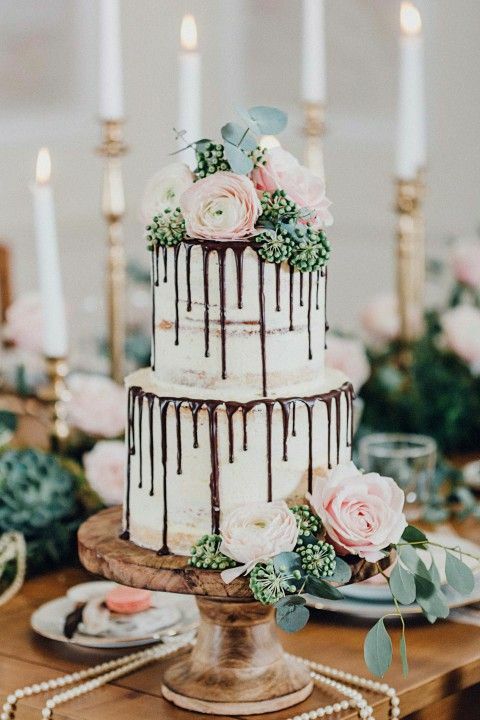 Vintage wedding cakes can also be on trend. 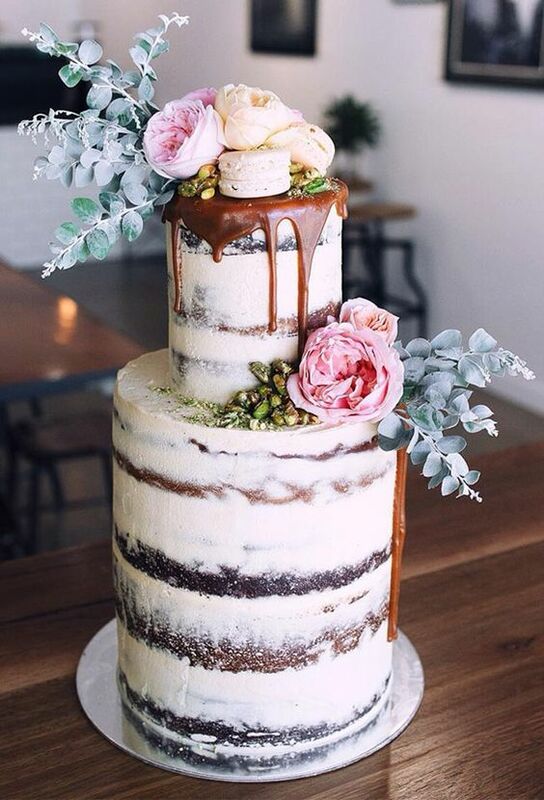 Check out this dark chocolate brownie salted caramel floral drip cake with coconut and pistachio. A blast from the past! Steampunk wedding cake. 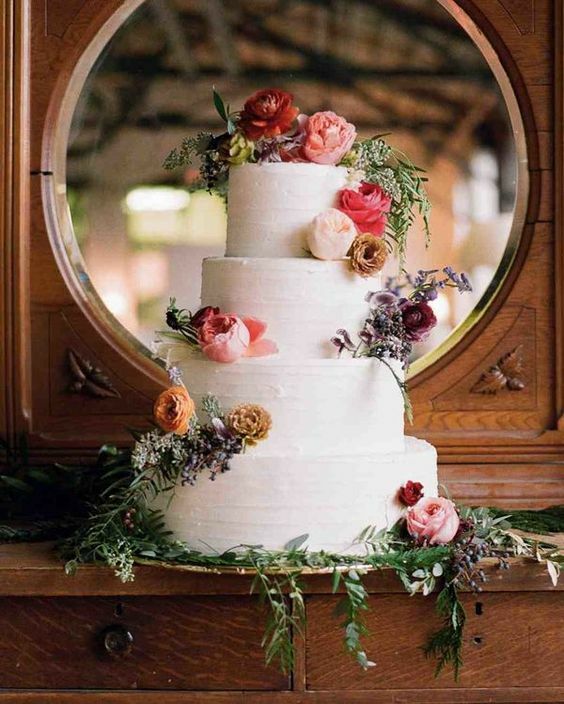 Rustic vintage wedding cake featuring colorful floral decorations and greenery. 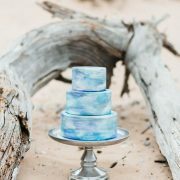 These incredible vintage wedding cakes are very well suited for boho, country and even with industrial wedding themes. Besides, cakes are getting smaller, so indulging in one of these romantic creations will not blow your budget too much. 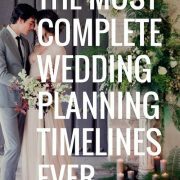 Is your wedding an all-out glitz and glam affair to be remembered? 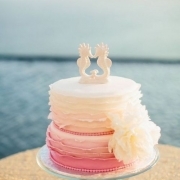 Make sure your cake stands out too! Multiple tiered vintage wedding cakes are decorated with eye-catching details, such as bright colors and even glitter (edible, of course!) Silver and gold may adorn the cake as ribbons. 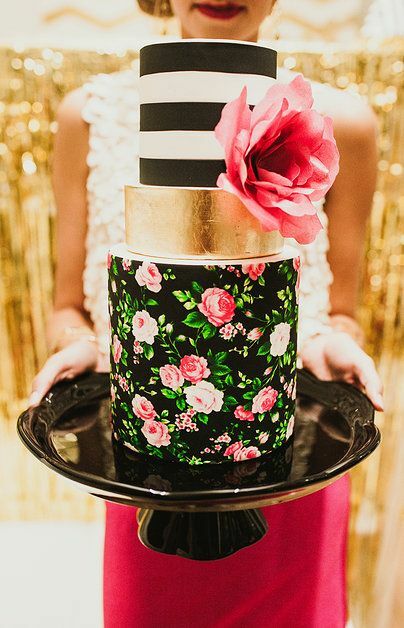 Expect a bold statement with a glam cake. 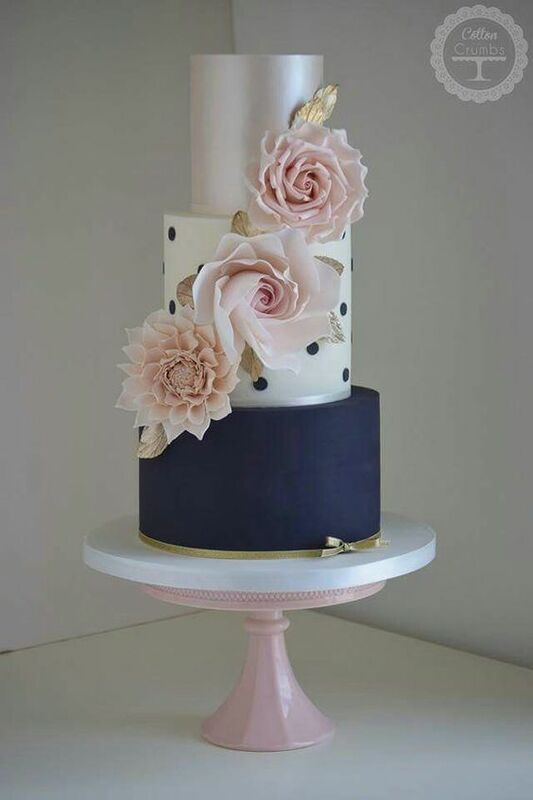 A glamorous bride deserves a cake to match. 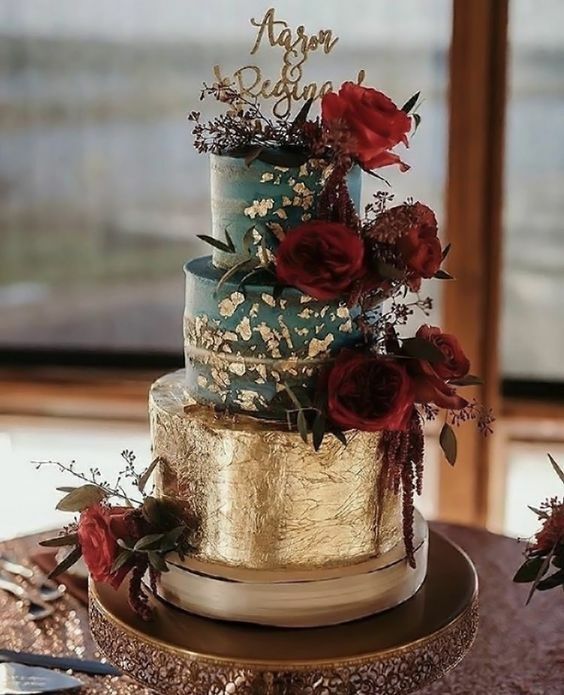 Contrasting roses against a superb gold foil wedding cake atop a band cake plate. 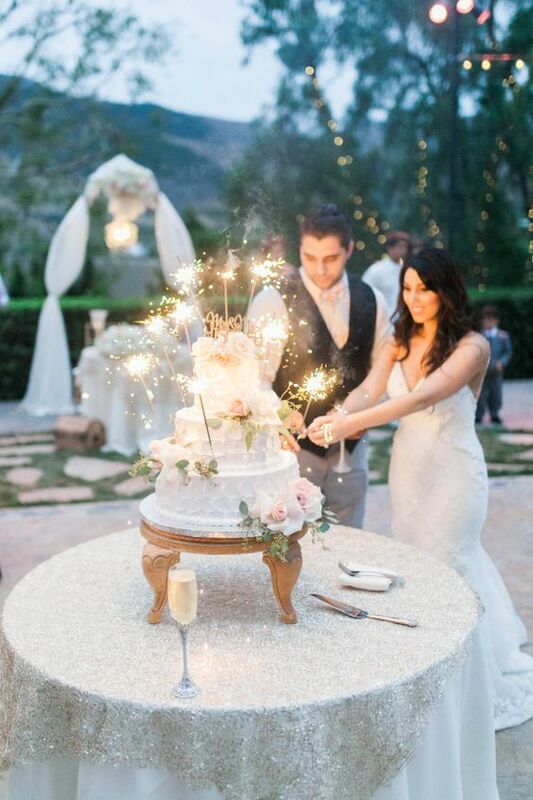 Such a stunning wedding deserves an insane five-tier cake. Simple elegance almost on the side of dreamy and nostalgic romance with lots of small glamorous details. 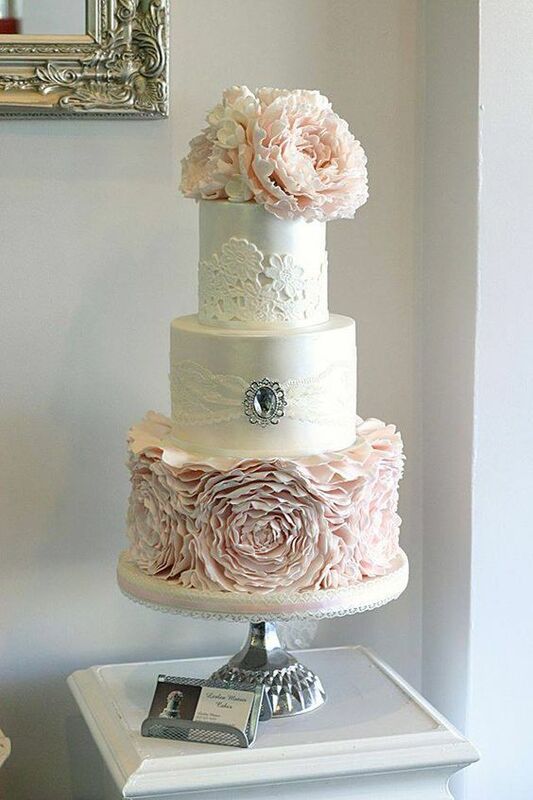 Ruffles, satin and edible roses are indicative of vintage wedding cakes. Perfect for a Paris-themed wedding. 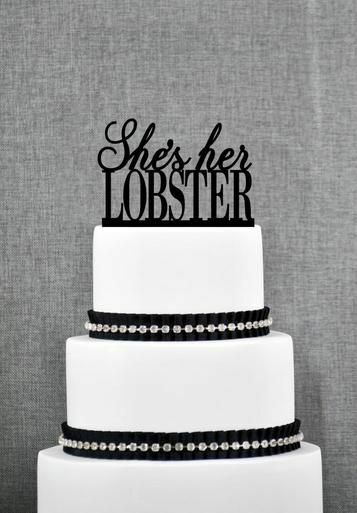 Simple and decorated with jewelry and an adorable “She’s Her Lobster” cake topper. A traditional cake is generally round or square with multiple tiers. They’re generally covered in white fondant or cream, with sometimes some color added with fondant flowers or other small details. 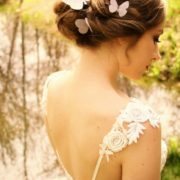 There are often white piped details as ribbon or beautiful lace along the edges. Wedding cakes traditionally used to be fruitcakes in the United Kingdom and America. This was due to how long they could last without needing refrigeration. If you’re having a classic white wedding, a traditional wedding cake will go perfectly. It’s very classy and would look elegant on any cake table. 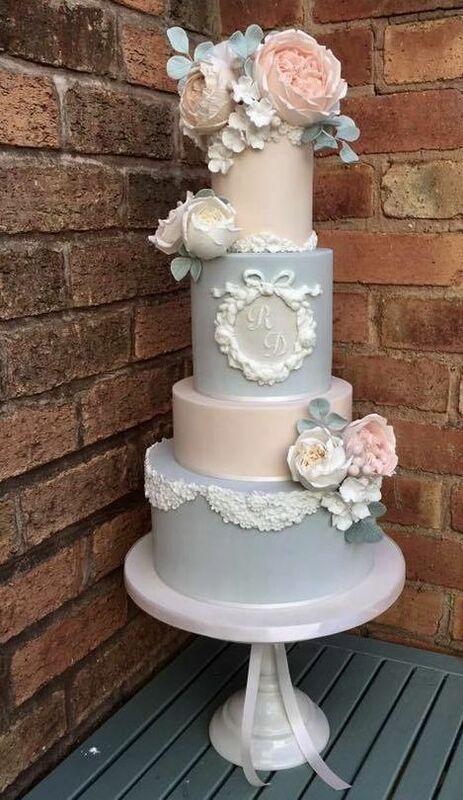 Delicate vintage wedding cake in blush and blue with lace details inspired in the bride’s gown by Cotton and Crumbs. Intricate lace design gives an impressive look to a completely white wedding cake. 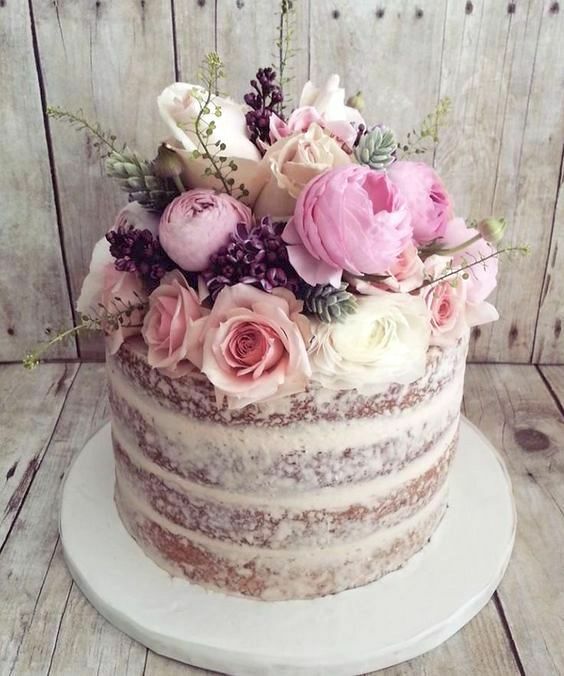 Roses and baby’s breath featured on this naked wedding cake. 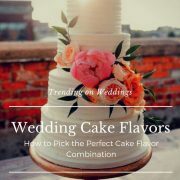 If you are all about sticking to traditions, especially when it comes to grandma’s secret chocolate chip cookie recipe, opt for classic vintage wedding cakes that feature a simple flavor like vanilla, buttercream frosting, and a little to no add-ons except florals. Big flowers adorn the cake from all angles on every tier. It’s all about the details, amiright? 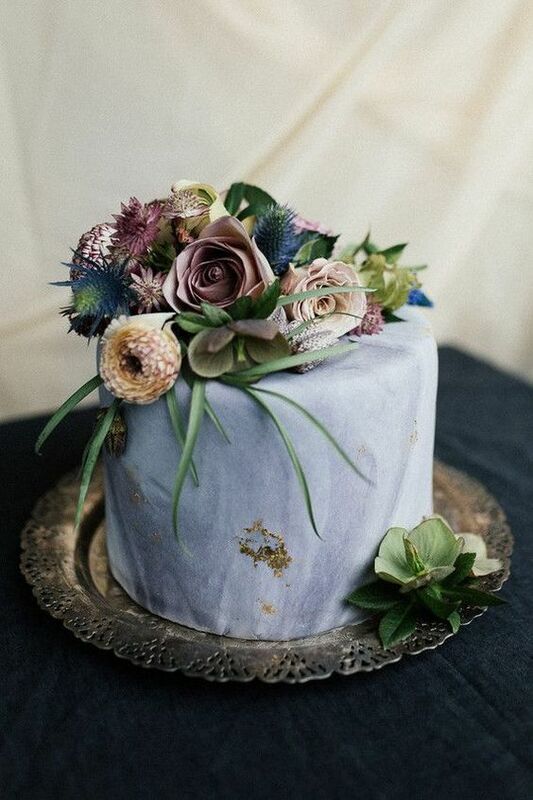 Heads over heels for these glam vintage wedding cakes by Bliss Pastry. 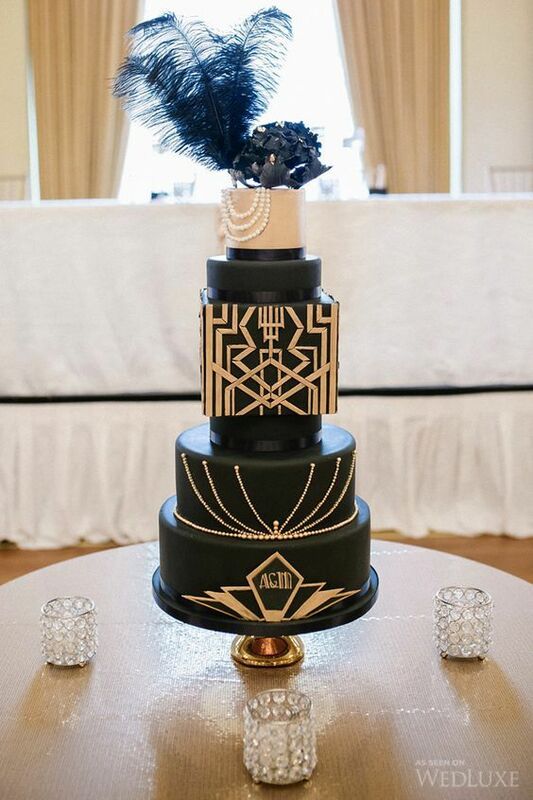 A modern twist on vintage wedding cakes. 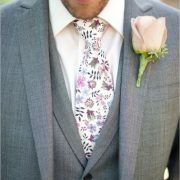 Gold bands, hand painted floral patterns and black and white stripes. Don’t forget the flower! Grab a fork and spoon because you’re going to want to eat these cakes already. Seriously, all the way to the last bite! Lace vintage wedding cakes are some of the most striking details you can add to your nuptials. These confections are romantic, elegant and can give a beautiful touch of vintage charm to your wedding day. Adorable wedding cake accompanied by cupcakes. Chic vintage style wedding cake with an old world feel. A modern take on vintage wedding cakes by Cotton & Crumbs. Cake cutting time! Photography: Maria Lamb. 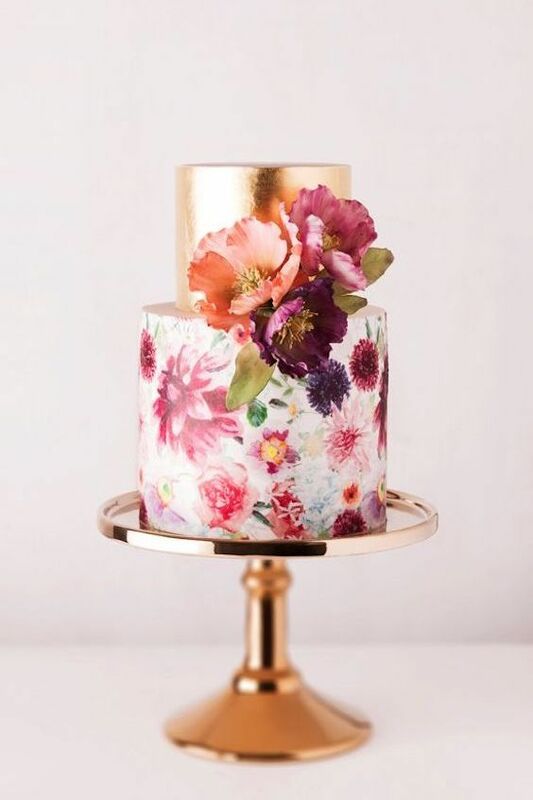 Hand painted floral cake with bronze. 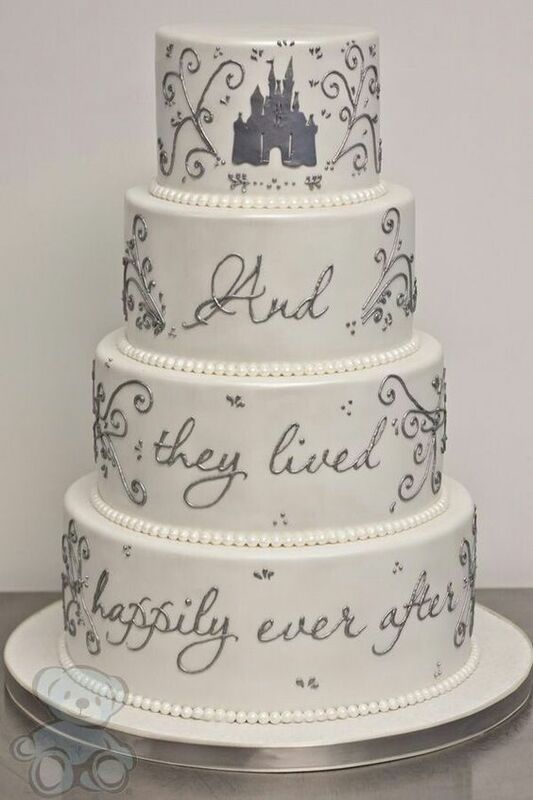 Love the intricate details on this vintage wedding cake. 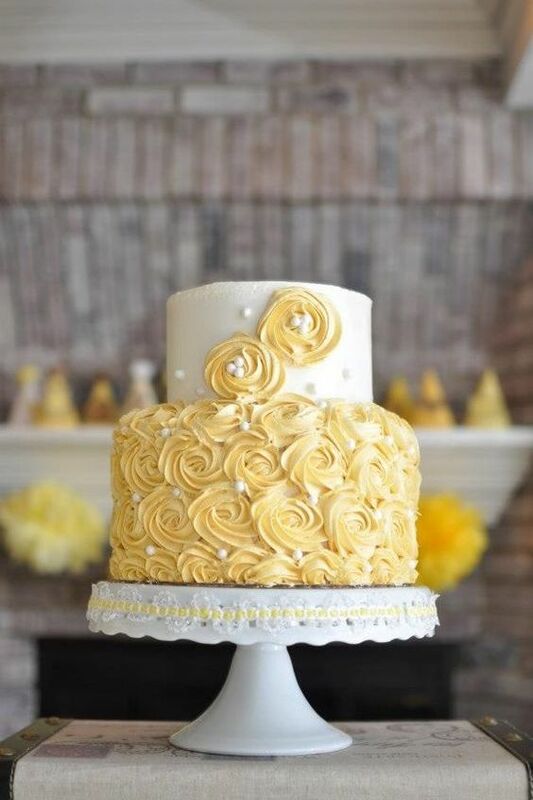 Yellow vintage style cake covered in buttercream rosettes. Hand painted in Chinese porcelain motif. Cake by Sugar Cubed Cake Creations over an old sewing table. Wanderlust wedding? 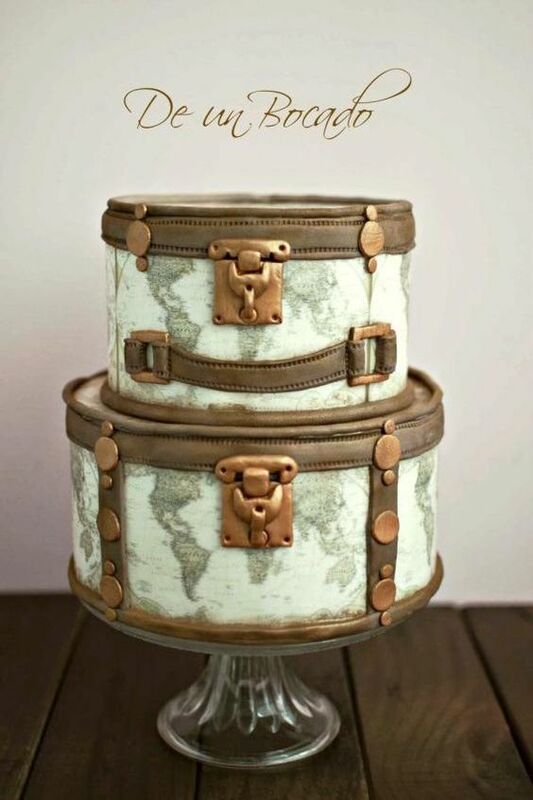 Vintage travel cake by Carmen. 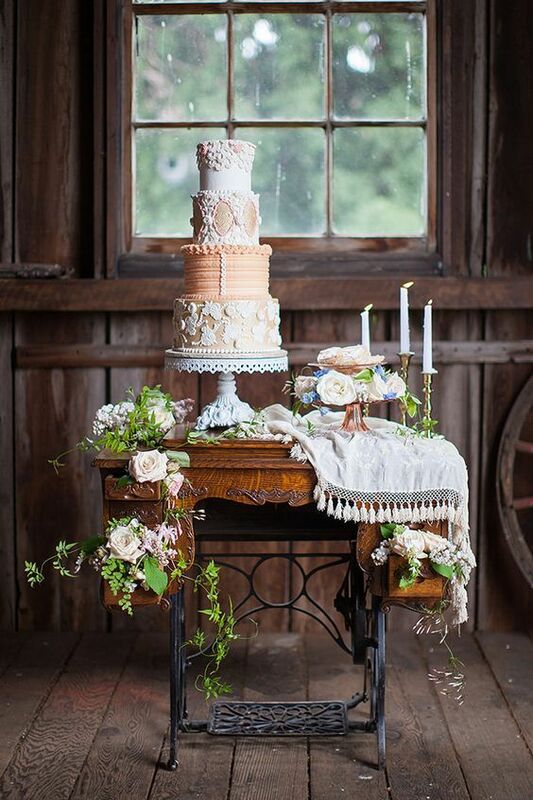 Rustic vintage wedding cake design. Matt Wood Photography. Let’s travel to the world of vintage cakes. 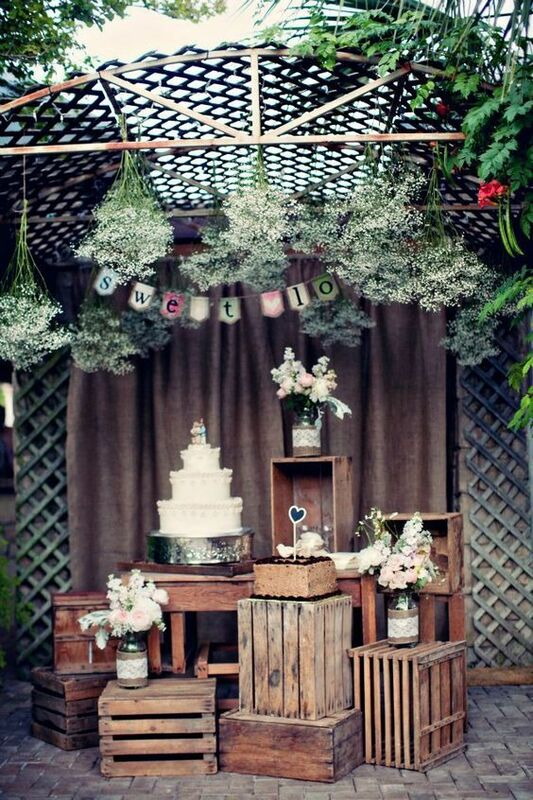 Rustic vintage cake display with crates. Impressive cake captured by Life Studios at the Fairmont Hotel, Vancouver. Creativity, classic color and traditionally styled detail is key to vintage wedding cakes. They will transport you and your guests into a world of charm, elegance and romanticism. 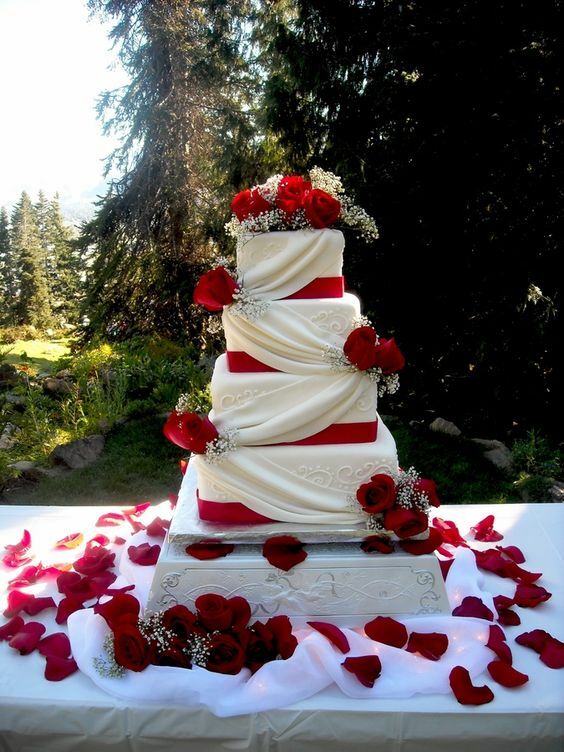 Now, take a look at these 45 classy & elegant wedding cakes, graceful inspiration tier by tier. 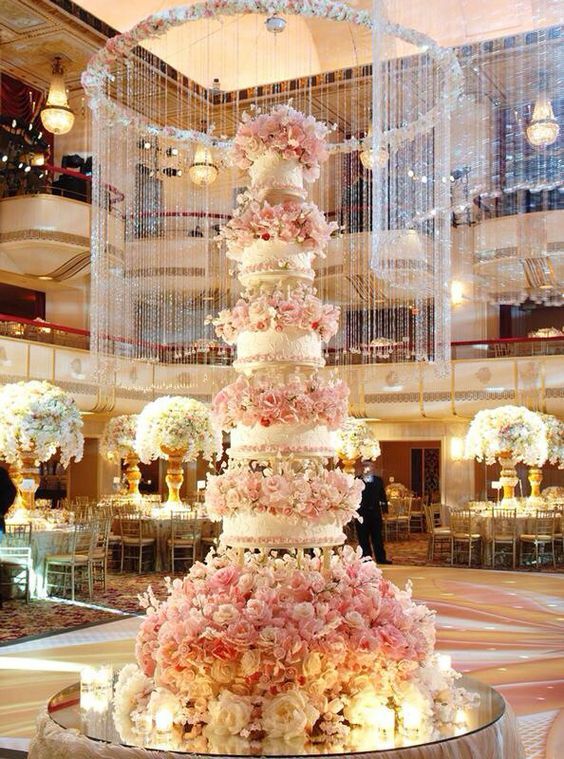 This five-tiered cake stood six feet tall and had over 4,000 Swarovski crystals! If you are decorating your own cake, here is a simple way to create some fab quilted effects. So beautiful! 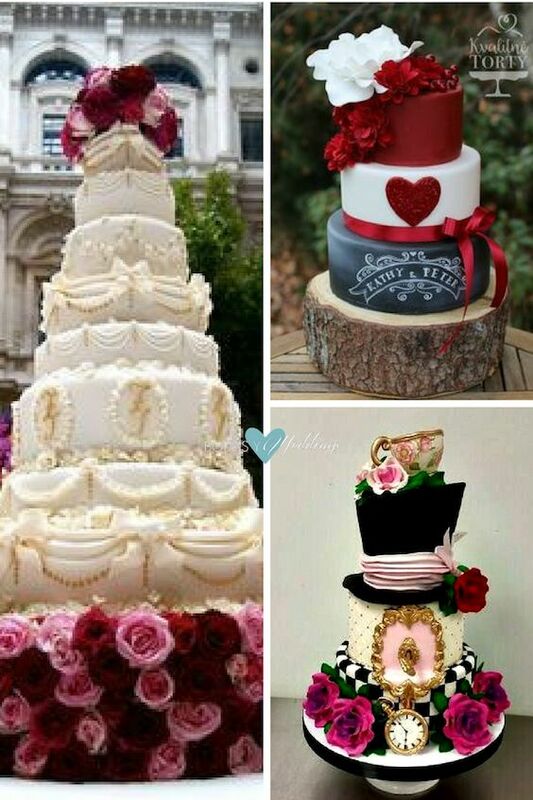 I’m thinking of having vintage cake for my enchanted forest wedding. I will show these to my baker and see what she thinks. Como Decorar La Mesa De Los Niños En Tu Boda ¡Ideas Fabulosas! Lo Último en Bodas 2018 ¡Tendencias, Colores y Decoración de Locura!